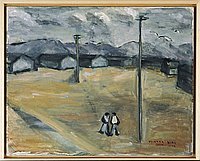 Image in brown and gray hues of two small figures walking in foreground next to a utility pole in open area bordered by barracks of Topaz concentration camp against a backdrop of darkening skies above mountain range in Topaz, Utah from an elevated perspective. A second utility pole stands at midground in open area. Two birds fly above at top right. Signed in caps, LR: Hisako Hibi / June 1943. Written on back: Hisako Hibi June 1943 at Topaz. This work provides a partial view of Topaz concentration camp from an elevated vantage point. Hibi positions the viewer looking down upon this open space bordered by rows of barracks. Two figures walk together in the foreground while a large bird appears in the far right corner. The mountain range stretches across the background below the billowing dark clouds in the sky. This landscape is typical of Hibi's camp paintings in that it provides a view onto the camp which is depicted as empty and stark. Only two small figures appear in the scene, quietly making their way across this muddied area.